I'm in the midst of cleaning and organizing my studio in preparation for my upcoming Artist's Along The Bitterroot Studio Tour (June 5-7). 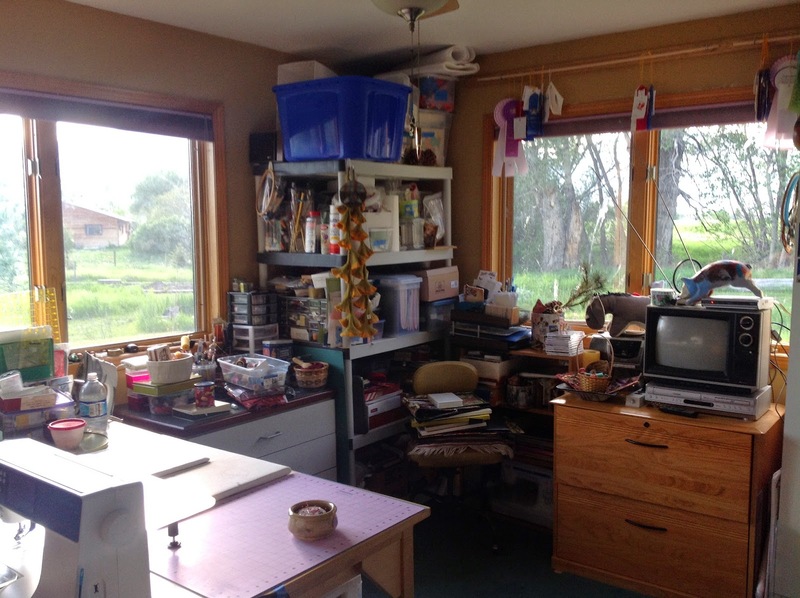 My studio has been a disaster area for a few years now and I have avoided it a lot this past year. With the excuse of not being motivated to create because of the death of my mom last June, I have not been making as much art as I have in previous years, or should be making. Since my mom was one of my biggest champions and certainly an inspiration for me, this is partially true. 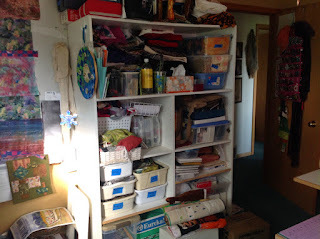 But the other part of it is that the room has just become a catchall for anything that can't find a home elsewhere in the house and I have let it become that. So this week I decided to tackle it and actually make myself throw out some things. Nothing that anyone else would want---an accordian folder of magazine articles with recipes and do-it-yourself projects that I will never make or do; clothing patterns that are not my size nor age appropriate and will likely never be made by me as I seem to have developed a strong aversion to clothing and home dec sewing; large cardboard boxes holding small amounts of little stuff that need to be sorted and put away; and magazines. Oh the never ending accumulation of magazines and the emotional parting of ways with them. What is that? Why do I get so attached to them? I rarely look at them again, unless they are Quilting Arts and I'm looking for advice on a new technique. 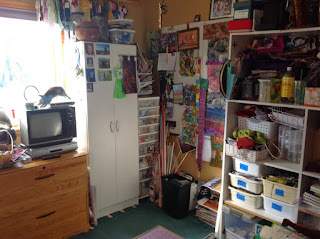 I use Pinterest extensively for finding recipes so all those old cooking magazines that I never went back to anyways are now history, as well as any quilting magazines that are full of patterns and designs I will never use! In the meantime, at least I can see and now use my sewing work spaces for pressing, cutting, and stitching. 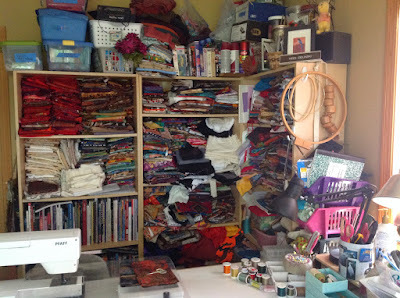 I can get near my design wall and I can access my fabric and beads. 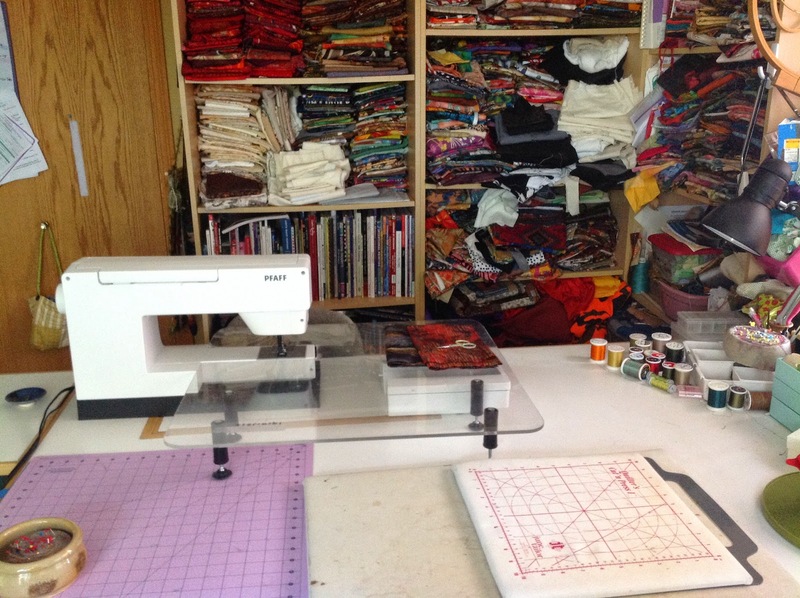 The carpet is no longer covered with stray threads and seed beads and the counters are relatively dust free! 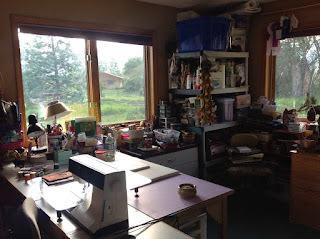 When I finish cleaning up the last details---things I don't have a place for and don't know what to do with—I will have a clean, albeit cluttered studio. 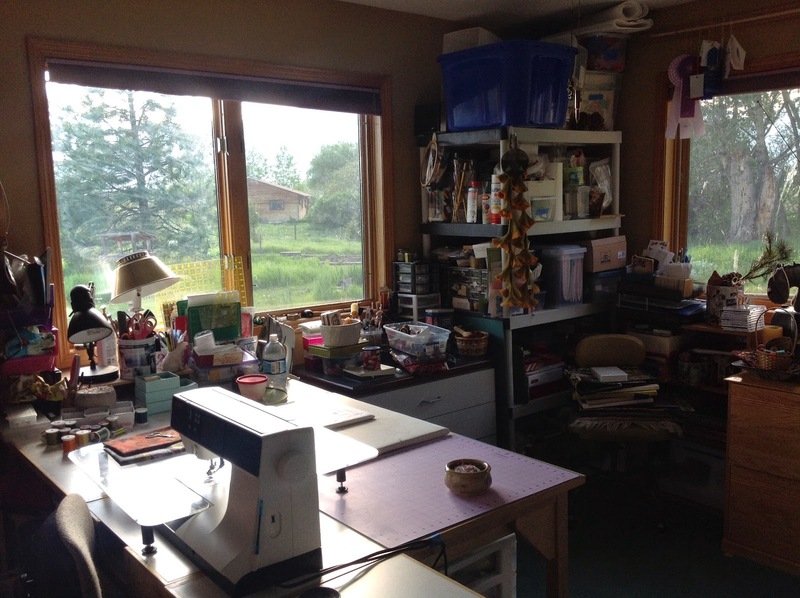 So what mixed-media fiber artist does not have a cluttered studio?! No matter how big a space it was I would fill it up with stuff. The smaller space just means I have to be a little discriminating in what I purchase or accept from those would like to gift things to me. Buttons, beads, old clothes made of silk or suede, books, trims, and certainly fabric yardage are all things that well-meaning friends and acquaintances want to give me. 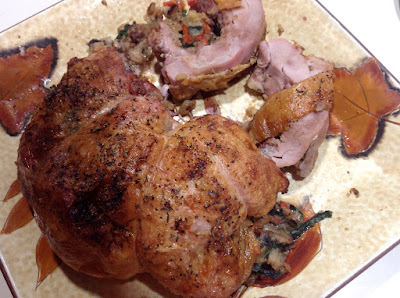 I have begun to say “thank you, but no” to most of them. I did recently accept a couple boxes of fabric and some Handwoven magazines because I had interest in perusing them myself before passing them on. Haven't even looked in the boxes of fabric yet, but I may find something in there of value as they are yardages of good quality fabric according to the previous owner. 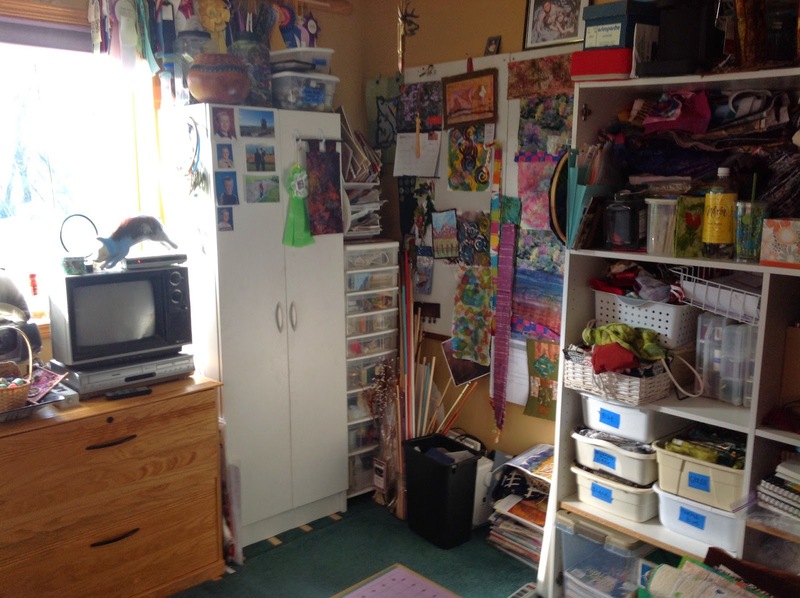 Of course we all have different ways of qualifying “value” and it is somewhat proportionate to the size of our studio and storage space! Hard choices, thoughtful organizing, and deadlines all work to make the studio a good working space that is enjoyable and functional. I had the deadline of making it presentable for a studio tour and that is good motivation. I always have worked best under deadlines. 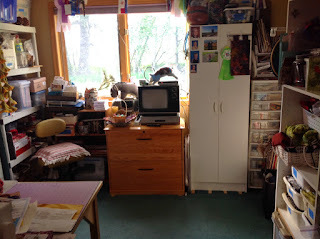 But now that it is clean I have no excuses for not going in there and, as Nancy Crow would say, Just Do The Work! I'm ready!